Having seen the teaser tweet back in June and being a massive fan of Kacey Musgraves I could not wait to hear Kacey’s debut Christmas album. I was not disappointed. The album opens with the good old favourite of Have Yourself a Merry Little Christmas. The tune is very jolly and Christmassy. Kacey’s natural happy singing voice really suits Christmas music. It is a great opening tune. Kacey follows this with another Christmas classic Let It Snow. This version features The Quebe Sisters. The Quebe Sisters’ sound is identical to that of the Andrew Sisters. This three part harmony as a backing vocal really sets the song in a yesteryear tone. Whilst the song is a throwback to times of old, the song almost sounds like an original due to the classic sound not heard in mainstream music that often. I really like this version. The next song probably sums up the thoughts and feelings of every child at Christmas time. Christmas Don’t Be Late is a waltz that would go down very well on the Christmas edition of Strictly Come Dancing. The song details all the things that a child would want at Christmas. The feeling of the song is summed up in the run up to and the title lyric I can hardly stay awake, please Christmas don’t be late. We then enter into the first of four original songs written by Kacey and others. 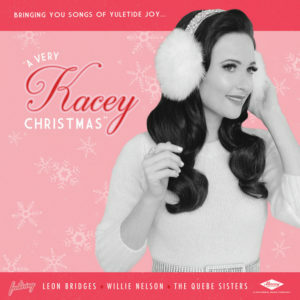 A Willie Nice Christmas is a duet with country music legend, and hero of Kacey’s, Willie Nelson. The song has a very Latin feel to it. With a ukulele providing the main melody of the song, the song transports you to a warmer climate such as Hawaii. The lyrics are as warm as the tune, that just wishes you a nice Christmas where ever you are and whatever circumstances you are in. I really like this song, and it is one of the highlights of the album. Maintaining the Latin feel Feliz Navidad (Merry Christmas in Spanish) is a song straight out of the Spanish festive song book. It is full of Spanish guitars, castanets and every other Spanish instrument. Kacey sings part of the song in Spanish; it is really nice to have a change from English for a lyric or two. It is nice to hear how another language sounds when it is sung, even if my Spanish is not good enough to translate it back to English! As the title suggests, Christmas Makes Me Cry is an original melancholy song. The song details all the negative aspects of Christmas such as absent loved ones, being lonely at Christmas time and Mum and Dad getting a little greyer. Whilst this song is not a traditional happy Christmas song, it is an appropriate reminder that Christmas is not always a happy time of year for some. Kacey pens a love song next, set in a Christmas backdrop. On this song she duets with Leon Bridges, a soul singer. Present without A Bow discusses the concept of being without your partner is like a present without a bow. Leon’s soulful voice adds something different to the duet rather than two country artists with two country voices. The tune is very catchy too. Mele Kalikimaka (Merry Christmas in Hawaiian) is a song that I thought was an original when I heard it. Having done some research, I discovered it was originally recorded by Bing Crosby. I fell in love with this song instantly. It is such a happy, bouncy song. Kacey’s version is a lot faster than the original and features a lot of steel guitar. The Quebe Sisters provide backing vocals once again. Kacey performed this song, along with Christmas Makes Me Cry on this CMA Christmas show. I highly recommend the show to get you into the country Christmas spirit. The equally cheery and bouncy I Want A Hippopotamus For Christmas continues the happy theme of the album. I know this song from having heard the Gretchen Wilson (also a country artist) version. The song always puts a smile on my face, and I love how they use rhinoceros as a rhyme for Hippopotamus. Kacey does her version of an all time classic song next. There is not a lot to say about her version of Rudolph the Red Nose Reindeer other than it’s done in her style. The children providing humorous backing vocals is a nice little addition. Ribbons and Bows is Kacey’s final original song on the album. It is a moderately paced love song about not needing ribbons and bows but needing one’s love. The instrumental for the song is played on a saxophone. It is quite an odd thing to hear a saxophone on a country song but it works very well in this case. The album is rounded off by an original subject matter for a song but a cover in the circumstances. What Are You Doing On New Year’s Eve? Is a slow number asking someone to be a date to see the New Year in with. It is a sweet love song that would go down well towards the end of the night a New Year’s Eve party. Kacey has done a video for this song that I think symbolises the song perfectly. 12. What Are You Doing On New Years Eve? As I said at the start of this review, I am huge fan of Kacey Musgraves. I therefore loved the album. I loved the blend of originals, less well known covers and classic Christmas songs. Kacey put her stamp on every song to make it her own. There was a mixture of musical styles in the album as well. This gave the album variety and depth. I hope this is the first of a few Christmas albums and if there are to be more Christmas albums, I cannot wait for them!